Virgil Kinzie “V. K.” Snyder was a pastor, peace advocate, and above all, a Bible college teacher of the Mennonite Brethren in Christ (MBiC)/ United Missionary Church/ Missionary Church. He was born 7 January 1906 near Carstairs, Alberta, Canada, to Norman Betzner Snyder (18 January 1870-1951) and Clara Detweiler (Kinzie) Snyder (24 June 1876-1947). Virgil's parents were born in Waterloo County, Ontario. He was their fourth child of five, the second son of three. V. K. Snyder married Anna Marguerite Neufeld (1907-1998) on 2 June 1930. She was born to Jacob C. Neufeld (1879-1928) and Katherina Hiebert Neufeld (1879-1951) at Noelton, Alberta; her family were members of the Bergthal Mennonite Church near Didsbury. Her father had been a school teacher in Manitoba who moved to Alberta to homestead in 1904. Anna and Virgil had three sons who died at birth, and then two sons and a daughter who survived to adulthood. Virgil K. Snyder died in Didsbury, Alberta on 6 April 1978, and is buried in West Zion Mennonite Cemetery, Carstairs, Alberta. Anna died in 1998 in Calgary, and is buried with Virgil. V. K. Snyder was converted in 1920 and joined his family’s church, the Didsbury Mennonite Brethren in Christ Church the following year. A personal feeling that he was called to be a preacher was settled in the fall of 1924 when Virgil was in danger from a farm accident. Although Virgil enjoyed farm work all his life, he immediately made plans to attend North Pacific Evangelistic Institute (Portland Bible Institute, later Cascade College) in Portland, Oregon 1925-1928, a Quaker-related institution. He entered the ministry of the MBiC Canadian Northwest Conference in 1928 and was ordained by them in 1931. As a student minister, Virgil Snyder served his first church in Oregon. He served churches of the MBiC Canadian Northwest Conference from 1928 until 1934 (Mayton, Alberta, 1928-1930; Acadia Valley, a circuit of three meeting houses, 1930-1932, Didsbury, 1932-1934). During studies at Marion College (now Indiana Wesleyan) and Taylor University (1934-1937) at Marion and Upland, and at Winona Lake School of Theology, (BTh 1937), all in Indiana, Virgil was pastor of two Evangelical Friends churches at Little Ridge and Radley, Indiana. Virgil returned to the Winona Lake summer school for an MA degree which he completed in 1949. After his BTh studies, V. K. Snyder taught at Mountain View Bible College, Didsbury, Alberta for seven years, each summer involved in evangelistic work; at Emmanuel Bible School (later College), Kitchener, Ontario (1944-1956), where he was pastor at Breslau MBiC (1944-46) under the Ontario Conference; and as teacher of theology, Bethel College, Mishawaka, Indiana, (1956-1963). One year he and Anna went to Beirut, Lebanon (1957-1958) under the World Gospel Mission where he was founding principal and a teacher at Ebenezer Bible School. This school was set up by Samuel Doctorian and the (Armenian) Spiritual Brotherhood, a denomination encouraged by the United Missionary Society (UMS), the Mennonite Brethren in Christ / United Missionary Church mission agency. The UMS continued an earlier involvement of MBiC members through the United Orphanage and Mission to Turkish Armenians. Community unrest led them to return to Bethel College after one school year instead of the projected three. V. K. Snyder’s few articles in the Gospel Banner other than pastoral or evangelistic reports were devotional. His revival campaigns offered the grace of salvation and sanctification. After a summer of such activity (1934), Virgil and Anna wrote, “Never have we been more grateful for forgiveness of sins and entire sanctification through the precious Blood.” Privately, Virgil was disappointed that the United Missionary Church gradually turned away from the Anabaptist position on peace and war, and a plan to publish his 1949 thesis by the UMC did not materialize. With J. Harold Sherk, he represented the United Missionary Church at the Study Conference on Nonresistance at Winona Lake, Indiana, November 1950. The Pilot: Yearbook of Emmanuel Bible School (1946; 1949). Snyder, Anna M. “Partner of My Heart.” Unpublished 84 page typescript, 1984. Evangelical Missionary Church of Canada Western Historical Collection, Calgary. Snyder, Anna M. Personal communication (24 February 1981). Snyder, V. K. and Anna. “Testimony.” Gospel Banner (10 January 1935): 14. Snyder, Virgil and Anna. “Ebenezer Bible School.” Missionary Banner (February 1958): 9. Snyder, Virgil and Anna. “To Our Praying Friends.” Missionary Banner (May 1958): 11. Snyder, Virgil Kinzie. "The Christian and War: A Vital Problem Candidly Examined.” MA Dissertation, Winona Lake School of Theology, 1949. Stauffer, Irene, (niece of V. K. Snyder), Alberta. Personal communication (17 June 2015). Storms, Everek Richard. History of the United Missionary Church. (Elkhart, Indiana: Bethel Publ. Co., 1958): 202. Fuller, Clare. "Snyder, Virgil Kinzie (1906-1978)." Global Anabaptist Mennonite Encyclopedia Online. November 2015. Web. 19 Apr 2019. http://gameo.org/index.php?title=Snyder,_Virgil_Kinzie_(1906-1978)&oldid=132877. Fuller, Clare. (November 2015). 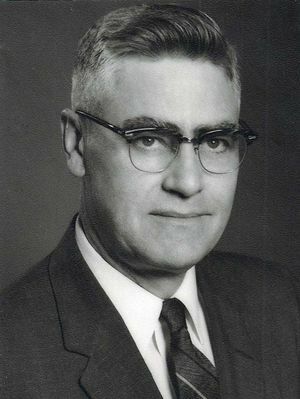 Snyder, Virgil Kinzie (1906-1978). Global Anabaptist Mennonite Encyclopedia Online. Retrieved 19 April 2019, from http://gameo.org/index.php?title=Snyder,_Virgil_Kinzie_(1906-1978)&oldid=132877. This page was last modified on 30 November 2015, at 21:29.